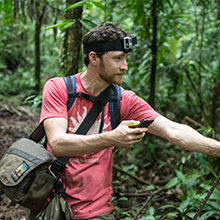 Matt is the Citizen Science researcher and Record the Earth Initiative guru. Engineering, technology and visual diagramming are some of my specialties that support the CGS team through web development, app development and grant proposals. When I’m not in the lab, I’m recording something with my phone, analyzing sounds uploaded to the Record the Earth website and enjoying Latino music and dancing.